10 Point Colored Jacket is Pre-Printed with all of the pertinent information pertaining to the Vehicle Sale, plus lines for placing the Color-Coded Labels on the side. 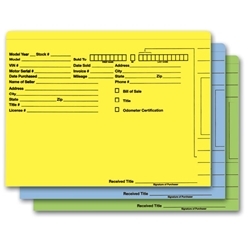 Easy VIN and Customer Name Identification makes this folder easy to file and easy to locate! Maximum quantity eligible for purchase is 4 packs (400 deal jackets). Please see link below for quantities of 500 or more. Color Coded Deal Jackets are normally packaged in quantities of 500 or more. Click Here for quantities of 500 and up.